Colloidal silver has long been used by people across the globe for its many health benefits. One of the primary health benefits of silver is that it can effectively kill bacteria within a very short period of coming in contact with it. When used internally it acts like a conventional antibiotic but it also has antiviral and antifungal properties which antibiotics do not. This same theory applies to horses which often suffer from a range of ailments due to microbe infections. 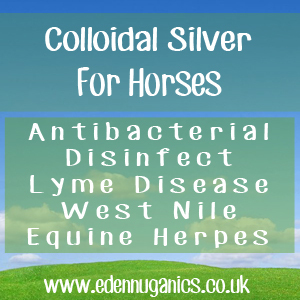 Colloidal silver is recommended for horses suffering from a large range of common conditions including: EPM, West Nile virus, Lyme disease, EHV-1, vaccinosis and many other bacterial or viral infections. As well as its internal uses colloidal silver can also be used topically for wounds and works well in conjunction with other types of therapies, including antibiotics. Lyme disease - Lyme disease is caused by a specific bacteria, known as borrelia burgdorferi, and is transmitted to horses by sheep ticks. As ticks need thick vegetation in which to live the disease is common in woodland areas. Colloidal silver is known to kill over 90% of bacteria it comes into contact with making it one of the most effective natural treatments for this tricky ailment. EPM - Equine protozoal myeloencephalitis occurs when horses are exposed to certain types of parasite, the most common type being 'Sarcocystis neurona' which infects and invades the central nervous system of horses often causing severe muscle atrophy. Colloidal silver is a very popular remedy in the treatment of EPM due to its antiprotozoal, antibacterial and antiviral properties. West Nile virus - West Nile virus is an infectious disease that is particularly problematic in horses. Spread by mosquitoes that have fed on infected birds, this viral infection can (at its worst) cause swelling of the brain and spinal cord. Once a horse has been bitten, it may take five to 15 days for symptoms to appear. The most common clinical signs in horses are muscle tremors and an altered gait. There is no known conventional medical treatment for this virus but reports of success using colloidal silver have been reported. No harm in giving it a try! EHV-1 - Equine herpesvirus-1 is a very common virus to find in horses generally manifesting in the form of a respiratory infection. EHV-1 is also a known catalyst for spontaneous abortions in pregnant mares. Simply adding a small amount of colloidal silver to your horses water supply each day when pregnant is enough to help dramatically reduce the chance of infection. How Much Colloidal Silver Should I Give my Horse? Around 20-30ml for each horse per day should be added to their drinking water. This should be enough when your horse is suffering from an infection of some sort. Be sure to change the water daily. If it seems your horse is not drinking the water a plastic syringe can be used to squirt colloidal silver into the back of the horse's throat to be directly swallowed. The benefits of using Colloidal Silver products for horse and rider.